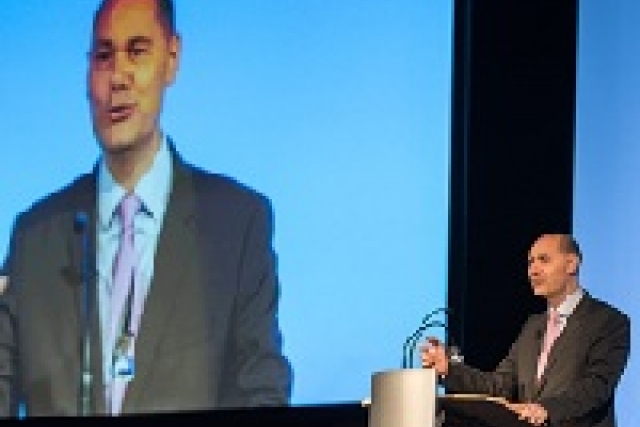 Emerald Media - ON TOUR: EBACE sees bright skies ahead. 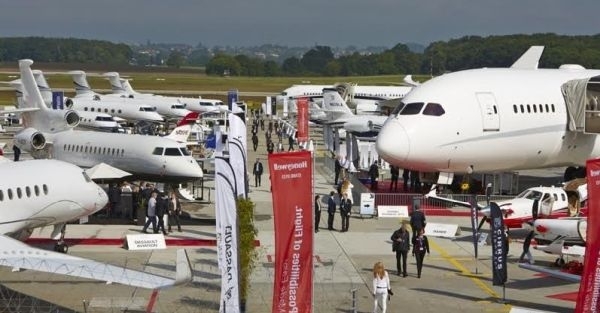 Talk of a triple-dip recession as business aviation activity in Europe dropped 2% last year was at odds with some of the exciting developments being aired (or whispered) at this year's annual EBACE business aviation show in Geneva. Rather, EBAA CEO Fabio Gamba hoped that unlike the recession of 2009 and 2012-2013, figures for 2015 could be just "a passing turbulence". There were some great highlights this year, not least a record attendance of 13,000 visitors from 100 countries; 450 exhibitors and 60 aircraft in the static, including several debutantes. 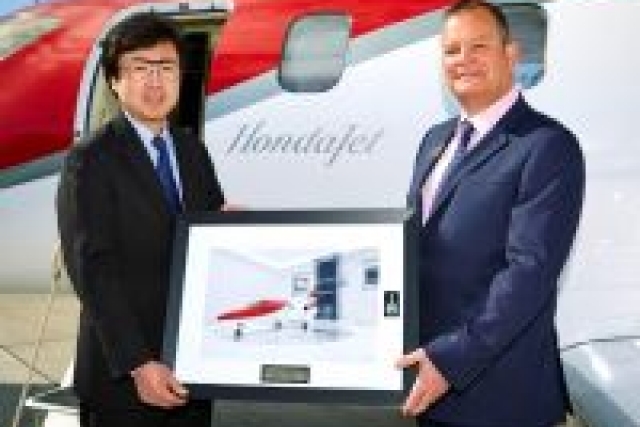 Honda Aircraft celebrated winning European EASA certification for its first business jet, the HondaJet, which was formally handed over to the UK-based sales distributor for northern Europe, Marshall Aircraft Sales, during the show. CEO Michimasa Fujino, the architect of the distinctive advanced light jet, which carries its two GE Honda engines above the wing, admitted it was touch-and-go to get its European ticket for the show. Steve Higgins, section manager of high-performance aircraft and turboprops from EASA, personally flew with the certificate from Brussels as Fujino announced Honda Aircraft is working to up production from three to four aircraft a month at its Greensboro facility in North Carolina. Pilatus Aircraft flew in its initial production PC-24 light jet for a day to display on the static for the first time, taking a short break in its flight-test programme. Textron announced the development of a new single-engine turboprop, designed to have a range of 1,500nmi with a top speed of 285kts. The market for this category continues to garner interest, buoyed by hoped-for new legislation from EASA expected late this year that will enable single engine business turboprops to be available for IFR public charter in Europe (see BTN BBGA On Tour, 21 March). Boeing brought the largest aircraft so far to the show, flying in a freshly VVIP Greenpoint Interiors-outfitted B787-8BJ which has just been sold to Chinese operator Deer Jet. Interestingly, its owners have chosen to register the aircraft under the new 2-Reg Guernsey registration. Airbus flew in an Airbus A350 XWB with an airline interior for a day and invited interested industry observers to view it at the adjacent Jet Aviation private terminal. The show started well with an exclusive media flight hosted by Flexjet over the Alps aboard a stunning art deco Global Express. The US fractional and charter company, which ordered the Aerion Supersonic jet at least year's NBAA Show, had a strong showing in Geneva, announcing its plans to launch Flexjet International in Europe later this year. 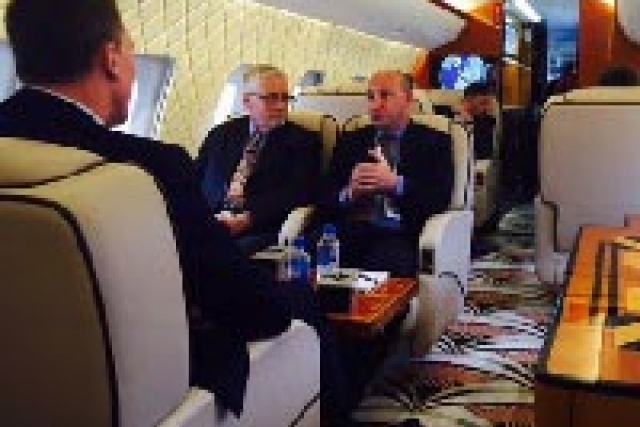 Former Bombardier vice-president Ray Jones will head the business from the UK and the company is currently negotiating with an undisclosed company to acquire an AOC. Previously owned by Bombardier, Flexjet was bought by the Directional Aviation Capital Group three years ago. Its European (mainly charter) activity will start with eight Nextant 400XT light jets, an aircraft modelled on the Hawker 400 but with new engines, avionics and interior. Flexjet was also named at the show as the undisclosed customer of 20 new Bombardier Challenger 350 aircraft, boosting its order-book of the type to 40. A panel discussion at EBACE heard that this cottage industry of 16 years ago has matured significantly, with consolidation and mergers the name of the game. Driving the charge is Luxaviation, whose founder and CEO, Patrick Hansen, is convinced there is more shake-out to come. The business aviation companies owned by Luxaviation, which co-exhibited at EBACE, are London Executive Aviation, ExecuJet, Fairjet, Unijet, Abelag, MasterJet - a cluster of business aviation operators that represent a great advertisement for a united Europe, collectively supporting 250 business jets. Hansen is not stopping there, however. He wants to grow the brand further and is working toward a public offering in 2018. Ahead of this, we can expect to see all these known brands phased out in favour of Luxaviation UK, Luxaviation France, Luxaviation Germany and so forth. But there is still a great deal of positivity in the niche end of the market. 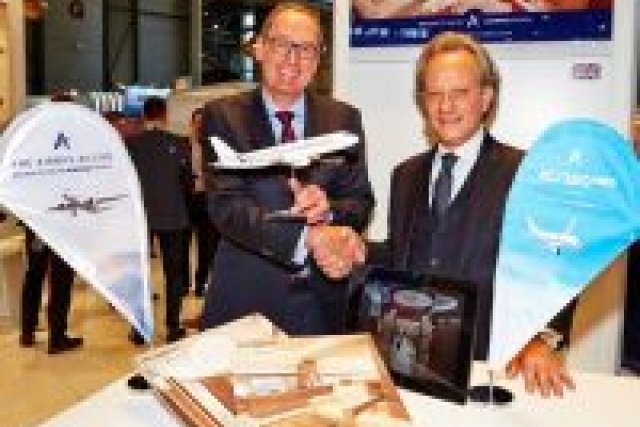 Last year at EBACE, UK-based luxury charter operator Acropolis Aviation announced a launch order for the Airbus ACJ320neo. This year, it was back to disclose the cabin designer of the new variant would be Alberto Pinto, which worked on the design of its original ACJ319. Acropolis CEO Jonathan Bousfield and Yves Pickardt from Alberto Pinto had a productive week meeting with various cabin outfitters. And UK-based Synergy Aviation, headed by Glen Heavens, is poised for some interesting expansion having just appointed Dave Edwards, ex-managing director of both Gama Aviation and Qatar Executive, as director. While the cost of attending and exhibiting in this expensive Swiss city grows more expensive each year, EBACE is without doubt an unrivalled showcase to introduce new products, for the manufacturers, right through to best-in-class cabin offerings. 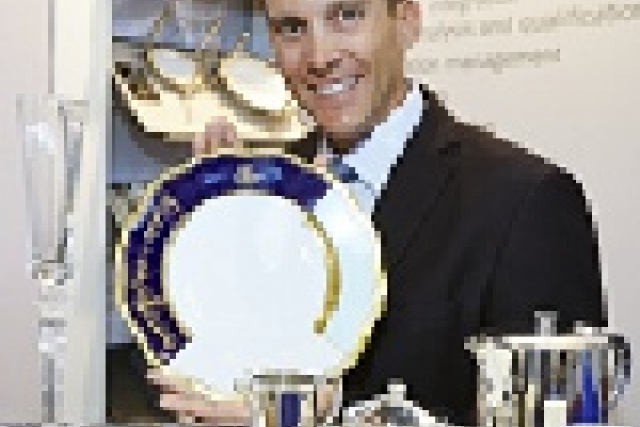 Dallas, Texas, based Dahlgren Duck, whose tailor-made fine dining ware, bespoke luxury amenities and art works for private jets are winning over bizliner operators in the Middle East, came to EBACE because it wants to expand its offering in Europe. There were also new initiatives by way of app. Farnborough-based Djetops unveiled PermitsGlobal, the first smart online flight-permit application, which automates the complex process of obtaining over-flight and landing permits, giving pilots and flight operators 24/7 control over their flight permit applications from a smartphone, tablet or via the web. Private Jet Central was at the show to talk about its new Down-Route app, designed to revolutionise crew-expense management for aircraft operators, giving them precise and real-time control over hotel bookings and other costs for crews as they travel around the world. Air BP, the fuel services company, sponsor and exhibitor at EBACE, announced its new Environmental Solutions offering - serving to meet the OEM's wish to reduce the cost of fuel and satisfying operators and airports as they seek to achieve a lower-carbon future. Its new service has been launched to help to mitigate carbon impact across the sector with its Reduce, Replace, Neutralise approach to carbon management. 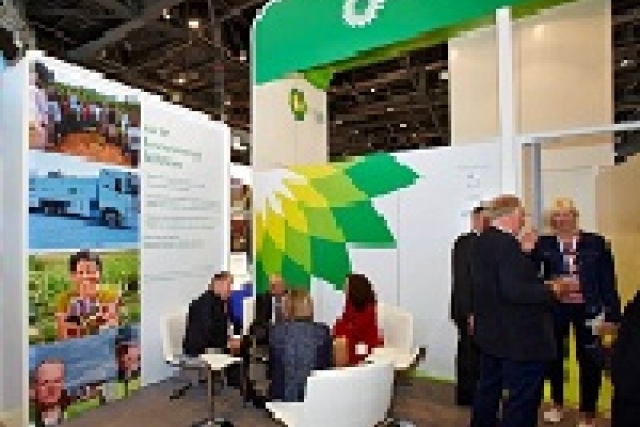 In a welcome move for an industry that takes the environment very seriously, Air BP offered delegates the chance to calculate their emissions to Geneva - and offset them for free. Next year's EBACE will again be at Geneva from 22-24 May.